The year was 1956. From the steamy jungles of Ecuador, news spread around the world that five young American men were mercilessly killed by members of the Auca tribe (now known as the Waodani)--a people those young men had gone to serve and befriend. That seemingly senseless tragedy a half century ago has become an inspirational marvel as that same tribe is now friends with the families of those they killed! 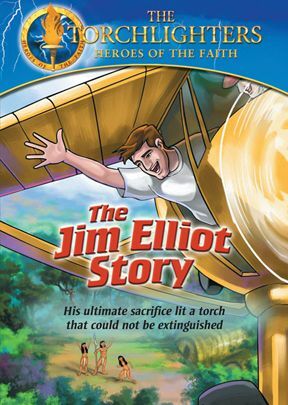 This is the story of one of those brave torchlighters--Jim Elliot. Jim Elliot spent his youth preparing to share the Gospel with those who'd never heard it. But nothing could have prepared him for the dangers and challenges he'd face in the jungles of Ecuador. The remote Auca tribe was suspicious and antagonistic toward even the most friendly of gestures from outsiders. Would Jim and his fellow missionaries ever be able to break down the hostile barriers and carry a torch of faith to this savage people determined to attack all outsiders? In this inaugural Torchlighters episode we follow Jim's adventures from his college years to his work in the jungles, showing young people his faith in action as he answers God's call to do the seemingly impossible. Fullscreen. This short animated film does an excellent job in brining to children the story of Jim Elliot and his four fellow missionaries. It begins in the 1940s when Jim, a college wrestler, is practicing with a friend. While pinning and almost being pinned by his friend, he talks about their going into missionary work together. Thus the film provides some helpful background on the martyr's earlier life and, in Jim's case, his marriage to Elizabeth, who becomes his partner in the jungle station in Ecuador. The violence is not shown in graphic detail, though it is not glossed over. The rest of the story unfolds very quickly, including the missionary families' forgiveness and the moving into the jungle village of Rachel Saint and Betty Elliot with her daughter. This would be a good investment for every church library and children's program. The DVD includes a fascinating piece in which Steve Saint talks about his parents and his experience, and how he went about to investigate why the men, although they were armed, did not use their weapons to defend themselves. The answer is very revealing of the depth of the faith of the five martyrs. The Jim Elliot Story is the first of a new series entitled "The Torchlighters: Heroes of the Faith." 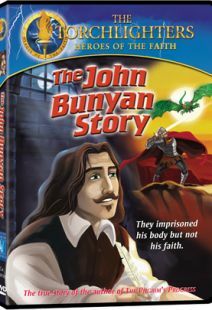 This ambitious attempt to bring the great stories of famous Christians to the attention of children 8-12 years old is highly commendable. Future titles in production are: William Tyndale; John Bunyan; Eric Liddell; and Perpetua. Watch these pagers for reports on them. If they are even half as good as the first title, you will not want to miss them. Torchlighters is a series of animated, adventure features targeted for 8 to 12 year-olds that tell life stories of Christian heroes. This one shows, in an age-appropriate way, how five young men were martyred by Ecuadorian tribal Indians in 1955. For all but the extremely sensitive, two scenes of Auca Indians killing with spears - first a group of oilmen, then Jim Elliot and four other missionaries - is not too violent for this age group. Most will take away the message in Jim's own words, "He is no fool who gives up what he cannot keep, in order to gain what he cannot lose." Recommended for any church library children's media collection. 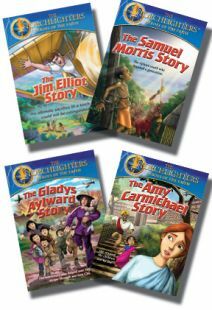 The Christian History Institute has teamed up with International Films and Voice of the Martyrs to launch a new animated children's series, "The Torchlighters." 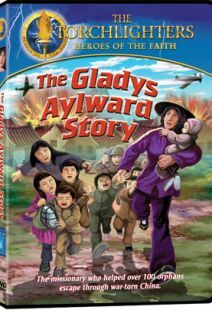 Targeting ages 8-12, the series is designed to introduce children to the lives of heroic men and women from Christian history. The first episode, The Jim Elliot Story, was released in March and covers the inspirational life of missionary martyr Jim Elliot. 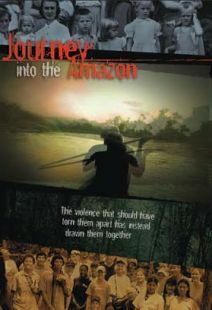 The DVD follows Elliot's adventures from his college years to his work in Ecuador through to his martyrdom at the hands of the Auca Indians. "Vision Video has planned this series over the past four years in partnership with its sister organization, Christian History Institute," said A. Kenneth Curtis, executive producer of the series. "Many excellent ministries have been developed to minister to teens, but we felt the need to reach children at an earlier age. So Torchlighters was conceived in the awareness that children love stories, and a well-told story will remain with them for the rest of their lives." 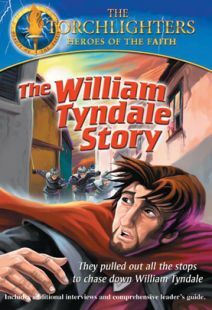 Thirteen episodes are planned for the Torchlighters series with episodes on William Tyndale and John Bunyan currently in production for a fall release. In addition to the DVD programs, educational supplements have been created to accompany the video, including curriculum, children's activities and a Web site. "Our hope and prayer is for the Torchlighters stories to give children a foundation in the history of the faith that will give them grounds to stand up to secular influences and recognize that in the treasury of Christian heroes they have worthy models for their own lives," Curtis said. 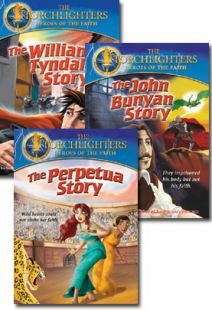 A new animated series aimed at children from ages 8-12, The Torchlighters "tells the story of Christian heroes who have risked their very lives to bring the message of Jesus Christ to an antagonistic world." In this program, Wheaton College hunk Jim Elliot is wrestling with Ed McCulley, but instead of the usual trash talk amidst the grunting and fighting, Jim says, "You ought to be a missionary, Ed, and I'm praying God makes you one." During the mid-1950s, the pair embarked (along with others) on a missionary expedition to locate and convert the Auca people of Ecuador, who initially extended a tentative welcome to the missionaries, but later killed them. While some might have taken this as a hint, the widows and children of the slain men eventually traveled to the Auca village to meet the people, forgive them, and teach them about Christianity. Regardless of one's feelings about Western Christianity's mission to save "savages," this production should have spent more time on the women, who not only had the courage to meet their husbands' murderers but also to continue working towards fulfilling their goal. 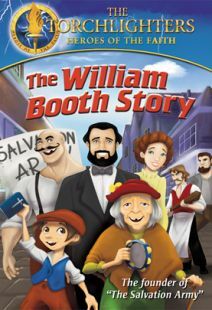 Still, this is a well-done program, overall, and DVD features include bonus live-action interviews with two other missionaries from Elliot's group. Recommended. 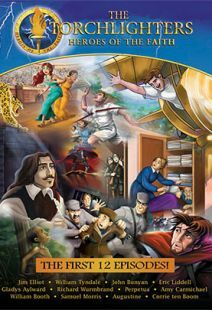 The Torchlighters video series is a new series of animated DVD’s dedicated to “Highlighting the honor, integrity and life-changing experiences of those well-known and little-known Christian men, women and children who in response to God’s call, dedicated their lives to a life of whole-hearted commitment and passionate service to Jesus.” It is a production of Christian History Institute along with International Films and Voice of the Martyrs. The first in this series is The Jim Elliot Story. 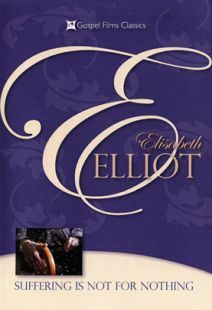 Elliot is widely known in the Christian world because of the prolific writing and speaking career of his wife, Elisabeth. In 1956 Jim Elliot, along with four other young missionaries, were killed by a vicious tribe of Euadorian natives whom the men were trying to reach with the gospel. The tragedy has become an inspiration to people across the world as they have seen the families of those who were killed continue to love and serve among the tribe who put them to death. This video, which is about a half hour long, provides a brief glimpse of Elliot’s short career as a missionary. It introduces each of the men who served with him and shows their love for the Lord and their determination to serve him whatever the cost. 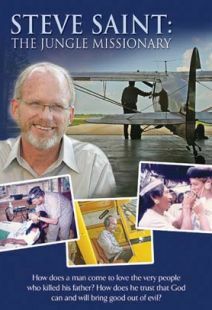 The cover for the DVD says, “In the inaugural Torchlighters episode we follow Jim’s adventures from his college years to his work in the jungles, showing young people his faith in action as he answers God’s call to do the seemingly impossible.” The story is presented well, focusing on the unshakeable faith of these young men. It should be noted that the series is targetted primarily at children between the ages of eight and twelve. I was hoping that I could show this film to my son, who is five, but my wife feels that it might be a little too intense for him. Perhaps next year. There is nothing too terribly graphic (certainly by today’s standards) but the viewer will nevertheless witness the deaths of many people, including the hero of the story. 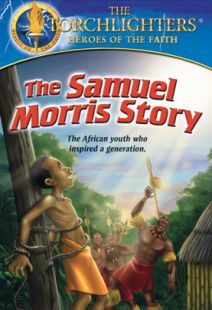 Included with the film is a study guide suitable for children that includes a leader’s guide and reproducible student worksheets; an interview with Steve Saint, son of Nate Saint who was killed along with Jim Elliot and who has gone on to serve with the same tribe; and a video autobiography of Marj Saint Van Der Puy, Nate’s wife. These add significant value to what is already a strong presentation, though these extras will appeal far more to adults than to children. 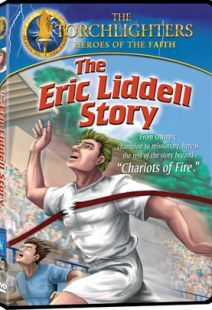 Future titles in the Torchlighters series include The William Tyndale Story (release is imminent), The John Bunyan Story (set for a 2006 release) and The Eric Liddell Story (also set for a 2006 release). This looks like a wonderful little series and I am sure each of the titles will be a valuable addition to any church or personal library. I hope to make each of these titles available to my children. Excellent video! Several years ago as a college student, I began reading many of Elisabeth Elliot's books and was very encouraged by Jim's devotion (as well as her devotion) to the Lord. Recently, I attended a conference and had the pleasure of hearing Steve Saint...WOW! What an encouragement! This video so accurately displays the commitment that these men had to the Lord! A must see for all! I can promise you that you will be encouraged! Definitely a must see for Christians (especially those living in America)! A very well told story of the missionary efforts of Jim Elliot and the team to reach the Auca Indians. The story is appropriate for children and my son of eleven enjoyed the DVD and learned of sacrifice and love. We also loved the extras on the DVD of Steve Saint telling of some of his stories growing up with these Indians in future years. A can't miss story for your children. We used this last week in a Childrens work, was excellent. The acting and animation is in a modern style yet compromises nothing to trends. I am always inspired by these amazing men, and the cartoon version in no ways detracts from this. 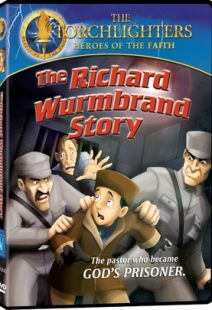 This is an excellent film for introducing kids to the story of Jim Elliot and his friends who were killed in 1956. The film does suffer from some technical goofs (the Aucas appear 20 feet tall in one scene), production glitches (Nate Saint sounds and looks about 50 years old), and several scenes (particularly those involving Jim's fictional college buddy, Ron) are slightly tedious and preachy. But faults aside, this is still a good film! I want to thank you for the Torchlighter series you did with Voice of the Martyrs. I hope you do more, if it's feasible! The cartoons and the documentaries are remarkable. 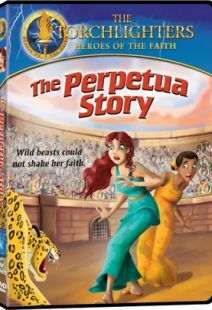 I have used the Jim Elliott and the Perpetua stories in both my church and in my classroom (I teach Bible courses, included a church history course) at a Christian school outside Atlanta, GA. Many of my kids, even though they're high school age, they have expressed how much the Torchlighter series have meant to them. It has motivated them to pursue the Lord more, to rest more in him, to share him more with others. How wonderful! Thank you for all your work. Tiffany Malloy - Great Resource for Young Kids! This is a fantastic resource!! It tells the story of Elliot and friends well, and I personally LOVED the bonus features--the two interviews and the downloadable lesson plans. I'd recommend this series of videos to anyone.